Welcome to the Nikwax blog » New Down Wash Direct wins its first award! New Down Wash Direct wins its first award! Our latest innovation, Nikwax Down Wash Direct, has just won an OutDoor Award in the Sustainable Innovations category at the recent fair in Friedrichshafen. Its high environmental credentials coupled with its outstanding performance, won the product this prestigious award, demonstrating that the best available technology can be eco-friendly! Down Wash Direct cleans and restores water repellency, is PFC-free and water-based for the lowest environmental impact, without reducing performance; in fact it can even improve the water repellency of regular down. In tests of untreated down washed once in Down Wash Direct, samples were shown to absorb almost 40 times less water. Nikwax developed this innovative down care product to serve the expanding offering of treated, water-resistant down products. Down is a highly effective insulator, but quickly loses its insulation powers when saturated with water. Water-resistant down fills, including Nikwax Hydrophobic Down (NHD) technology, address this issue. To restore performance after repeated use, treated down requires special care. Dirt, oil and other contaminants lead to water repellency diminishing over time. Down Wash Direct ensures optimal performance by cleaning effectively, revitalising insulation and restoring the water repellency of water-resistant down apparel and sleeping bags. “We’re proud to have created a product that genuinely performs without using harmful chemicals. The fact that it has been recognised by the outdoor industry as a “Sustainable Innovation” is a great acknowledgement of our environmental commitments” says Nikwax founder and CEO, Nick Brown. “We work hard to develop aftercare formulas that are safe for both human health and the environment. Nikwax has and always will be PFC-free, we will continue to innovate, providing consumers with safe, high performing aftercare products”. 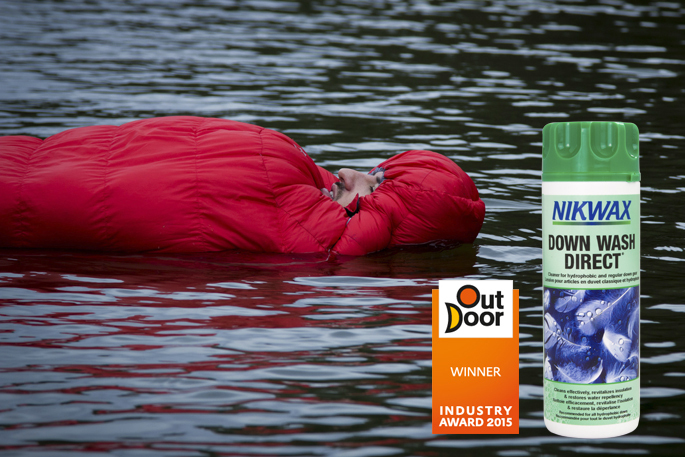 Nikwax Down Wash Direct is available now from online Outdoor retailers and will be in shops soon! Price: 100ml pouch £2.49, 300ml bottle £6.49 and 1 litre bottle £13.99. Nikwax only works with down processors that are committed to ethical sourcing. Note: The image you see above is for demonstration purposes only and is not to be copied.